Agility Classes are a playground for dogs! This fun sport will mentally and physically stimulate your dog, and it is a great bonding experience for you and your dog. 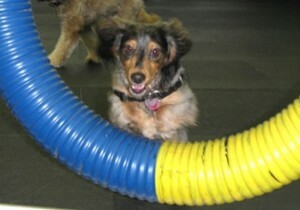 Agility classes are Sundays, Tuesdays and Thursdays at The Puppy Perfectors. Due to the nature of the training and the structure of Agility classes, no reactive dogs can be allowed. However, Private Agility is a great opportunity opportunity for shy or reactive dogs to try the wonderful sport of agility. If you are not a current student of The Puppy Perfectors, and have taken obedience elsewhere, you must attend an obedience level 1 class to be evaluated to determine if you and your dog is ready for the agility classes. Before attending the level 1 drop in obedience class you must attend an orientation first which is held Saturdays at 12:30pm. You do not bring your dog but it is helpful to bring the vaccination records as well as the registration form all filled out. If you are a current agility student elsewhere, and would like to join our program, please contact us. We will set up an evaluation of you and your dog to see what level would be best for you. The evaluation is $35. Puppy Agility is or puppies under the age of six months, or older dogs that are small or shy. Beginner/Intermediate Agility is an introduction to agility equipment and exercises. Dogs must have basic obedience. Advanced Agility is for those who have successfully completed Beginning & Intermediate Agility. Level 1 is an initial six-week session for $185. All other agility classes are $165 for six classes or $300 for 12 classes after the first six-week session. You have 6 months to use your classes. No refunds given for unused classes. $30 drop-in classes are also available after an initial six-week session. Puppy agility, for puppies under 6 months is offered once a month. It is a four-week session for $120 and has a maximum of 5 puppies in each class.